"She's never said a word--to the cops, to her doctors, to family--about those four years." Charlotte Graham is a woman with a horrific past. She has changed her name in an effort to distance herself from the horror and memories, but she'll never truly be able to put her years in captivity away completely. If dealing with that stress wasn't hard enough, she has to contend with liquidating her grandfather's estate. Her friends and business associates, Ellie Dance and John Key, have skillfully come up with a plan to assist her in this endeavor. Ellie is not only Charlotte's best friend, but she also manages Charlotte's art career. John has become as close to Charlotte as a brother and is her former bodyguard and current head of security. Running away from the past, attempting to liquidate millions of dollars’ worth of inventory (most of it in rare and mint condition coins), and donate funds to worthwhile charities is a very tall order. Before Charlotte meets Bryce Bishop, she is struggling with all three. Bryce Bishop is the owner of Bishop Chicago, a rare coin dealer. His business was chosen based on background provided by Ellie and John. But a tentative business relationship quickly becomes much more. 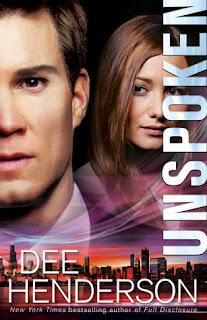 Unspoken was an intriguing story but a slow read for me, and the speed had nothing to do with the length of the book. It may be related to the fact that the beginning of the story was bogged down with plenty of technical details and jargon relating to numismatology. There were also plenty of subplots going on, such as a cold case investigation into a kidnaped baby that occurred around the same time that Charlotte was being held captive. There's also a burgeoning romance going on between Charlotte and Bryce. Family drama is added to the equation when it is revealed that Charlotte has a twin sister that was also kidnaped but released after twenty-four hours. Eighteen years after Charlotte's release, her twin sister has decided to share as much information as possible on the ordeal with an investigative reporter. (Told you there was a lot going on.) I think that subconsciously I had difficulty with this story because it is more Christian fiction than inspirational fiction. I admired the incorporation of prayer and trust in God that was portrayed by Bryce, but his prayers are alternatingly addressed to God and then Jesus. That may be off-putting to some readers and enticing to others. So I guess what it boils down to is did I enjoy the story and the characters? The answer is a yes with some reservations. Some of the dialogue and transitions in the first half of the story didn't seem to flow as well as it did in the latter half of the story. Some of the subplots were a bit convoluted (one character is presumably in her late thirties/early forties and has worked as a rare coin dealer, homicide investigator, and is now an author . . . seriously?). Even with these relatively minor objections I found Unspoken to be a good read that incorporates murder, kidnappings torture, rare coins, the art world, philanthropy, romance, intrigue, family drama, secrets, loss of faith, and religious inspiration.